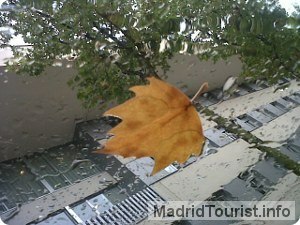 The Autumn is an excellent time to visit Madrid. The reasons are the inherent beauty of this time invites you to walk with pleasant temperatures, with many hours of sunshine, and it is now when the parks and gardens are more beautiful with mixtures of green, brown and orange. Full of charm and romance. To enjoy the beauty of autumn in Madrid we recommend, in particular, four parks and gardens: La Casa de Campo Park, El Capricho Park, Los Jardines de Sabatini and, of course, El Retiro. In addition, following the return of summer vacation are many events that come together in the city, both cultural events like sports: premieres of new plays and miscales, releases new art exhibitions and painting in the Prado, The Reina Sofia and Thyssen, many marathons, half marathon and fun runs, festivals. Fall is also the auspicious time to enjoy two great gifts of nature, related to the autumnal cookery: chestnuts and mushrooms. Although you will not find in Madrid chestnut. If is very typical found late autumn roasted chestnuts positions in any of the main streets of the city, they can enjoy a dozen roasted chestnuts for very little money. With the arrival of the first rains of autumn mushroom season begins. They can be found in El Retiro, in the Casa de Campo, and in other places in the surroundings of Madrid. In the Casa de Campo Park there are many species, some edible and others poisonous. Be careful! Also, if you do not move regardless of the city and closer to the mountains of Madrid can enjoy its forests, which are converted into recreational areas where many people walk their baskets under the arm for these delicacies. Mycological Tourism is a growing strongly, more and more fans of this hobby. The Sierra de Madrid has a varied natural wealth that favors the growth of various species of edible and inedible mushrooms. Be careful if you go looking for mushrooms! If you do not know very well, do not consume! Remember that there are very poisonous species. There are Mycological Associations that can advise you. Many restaurants of the capital, at this time, offer tipical dishes where the main ingredients are mushrooms and/or chestnuts.